Wildfires Threaten and Destroy Homes in Several States | The Voss Law Firm, P.C. Washington. A wildfire in the central part of the state turned into a serious threat with the dry, windy conditions on Sunday, June 28. It was estimated that 24-28 homes were destroyed by the blaze, as well as at least four businesses. Dozens of families were evacuated by emergency workers as the flames moved into town. Alaska. The weekend of June 21-22 saw the start of over 150 wildfires in Alaska, bringing the total for the season to 391. It’s estimated that at least 1,181,061 acres have burned, leading many people to compare this year with the brutal fires in the state in 2004, the worst fire season in the state’s history. June of 2015 has already been worse than June 2004, but the overall impact of this year’s fires remains to be seen. California. California’s long-standing drought has created dangerous conditions for fires, and lightning strikes from Tropical Storm Blanca added to the number of blazes already affecting multiple regions in the state. A wildfire also started on June 22 near the California border and threatened Markleeville, a community just 25 miles south of South Lake Tahoe. Hot temperatures and gusty winds pushed the fire closer to populated areas, and it is estimated that the fire had covered about 15,000 acres in just the first day. While recent heavy rains in Texas have reduced the potential for wildfires, other states can’t count on a break. 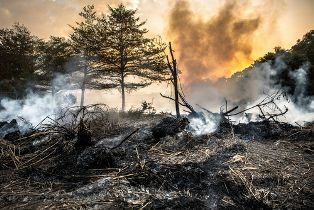 According to predictions, many states already affected by raging wildfires can expect more of the same dry, hot, and windy weather as the summer wears on. The 2015 wildfire season still has many weeks to go, and many more homes and businesses could be threatened in the coming months. If you live in a dry or fire-prone area, make sure you’re prepared for the worst. For more information about current weather events and tips for policyholders of all kinds, connect with the Voss Law Firm on Facebook—or give us a call directly at 1-888-614-7730 if you need help with a difficult claim now.